The Crystal Cathedral in Garden Grove, California. 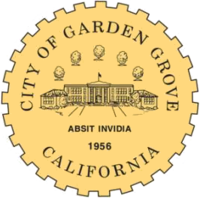 Garden Grove is a city in northern Orange County, California, United States. It is about 34 miles (55 km) southeast of the city of Los Angeles. The population was 170,883 at the 2010 United States Census. This page was last changed on 21 August 2018, at 20:30.